About noon, Manilyn and I were sorting out boxes of used stamps in the Stamp Room when I received a text message. 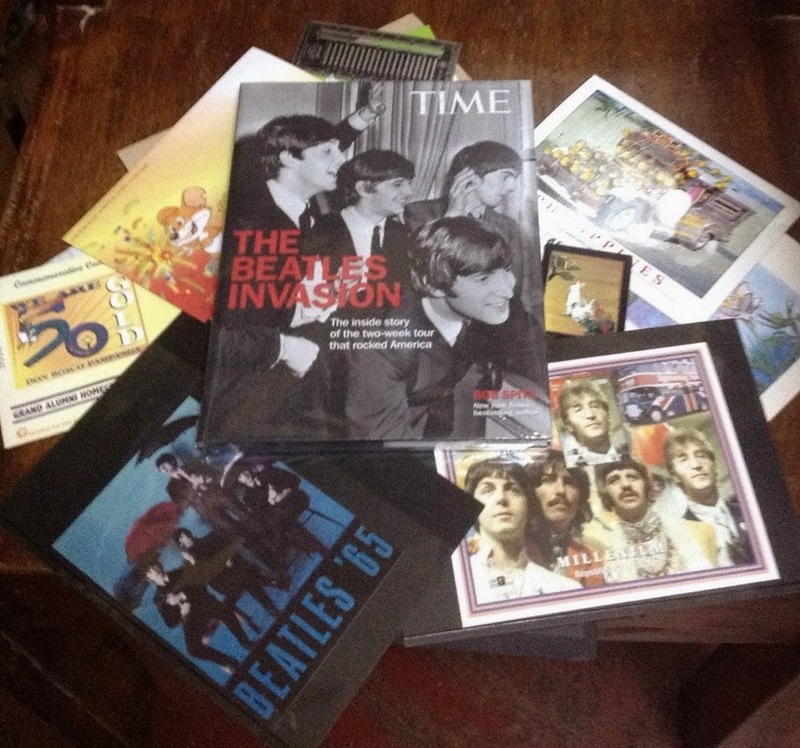 It's from "em of Fullybooked sm n0rth," informing me that "The book TIME:BEATLES INVASION has arrived and reserved under your name..." Dropping everything aside, I said, "Let's go. Bihis na tayo; kunin natin." Zoom (after a lightning lunch) to SM North's The Block, third floor. From the elevator I had to limp, assisted by Manilyn, a short distance to the Fully Booked branch. 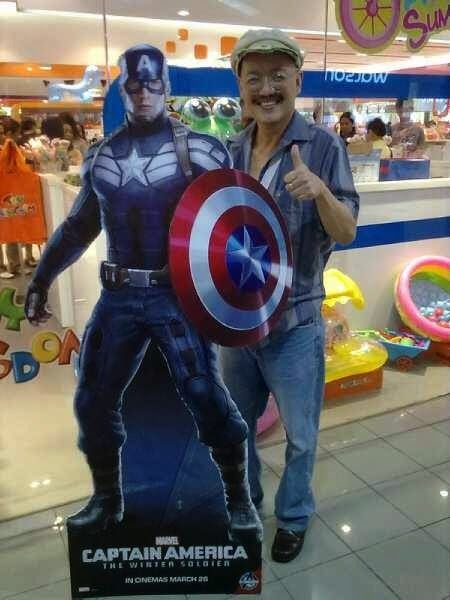 The fun thing is, before we reach Fully Booked, we have to turn a corner to Toy Kingdom's storefront, where earlier last week I tried to persuade Manilyn to snitch this Captain America cardboard figure into her bag. "Magaan naman," I told her, "Maganda sa Stamp Room ito." Apparently, the urban way of plunder has not eroded her provincial probity yet. So I settled for posing beside The Cap. Nearby is the more hefty Battle Blade figure. 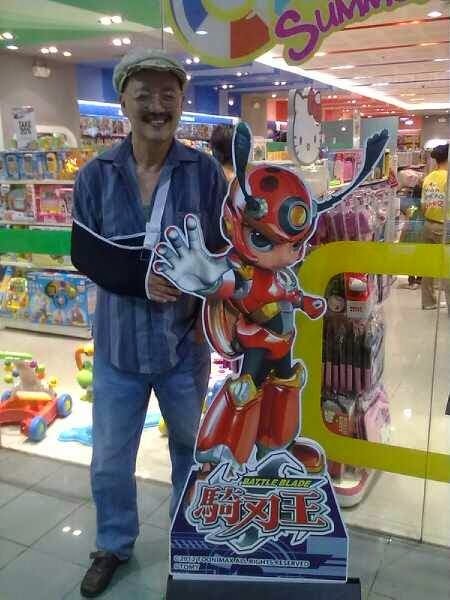 Since stealing this is not within my assistant's consideration (and training) yet, I settled for another pose. I'll dream of this tonight. Leaving the action figures with a Napoles glance, I went to the Fully Book counter and paid for the book. I had the impression that books in that store are somewhat expensive. Still I shake off the temptation to get the 10-volume boxed set of Neil Gaiman's Sandman TPB comics. The P7,999 price tag is a mighty assist to Leena's admonition whenever I'm off on a trek to Book Sale and NBS: "Don't buy anything over P1,000." Leena developed this bargain basement attitude after we went to a National Bookstore bodega sale early this year. Chess books that had been tagged at P900 were marked down to P75. 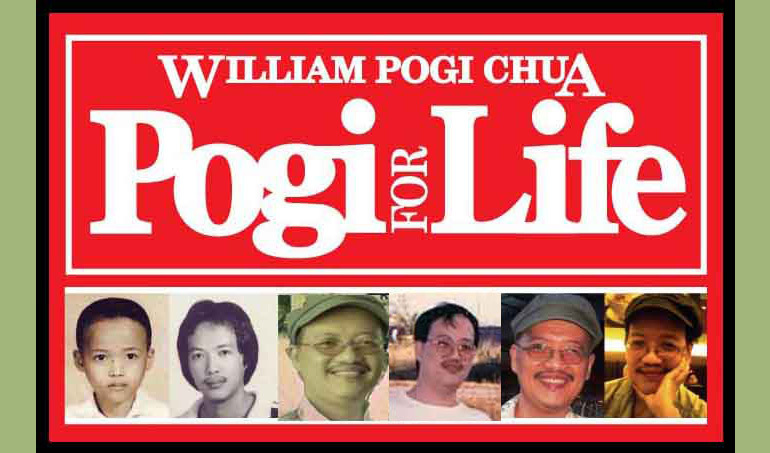 Bestsellers (James Patterson, Jody Picault, David Baldacci, Janet Ivanovitch and other pulp pushers) that were selling P350 in other branches were being sold at P30 each. And then there's her eBook contact, who for P10 per title will email the latest novels and some magazines to your dropbox to download to your eGadget. If you know how to go around Pirate Bay and other Streaming sites, you don't even have to pay P10 for any book, magazine, game or movie. We browsed in the store for a while, visiting the Sandman boxed set (bow!). Then we moved on t the local titles (Kiko Machine 10 is not available yet), then to a rack of postcards. I picked a picture of a Jeepney, P25. I bought it for two reasons: (1) I like the design. (2) I may make a little profit out of it like a picker. 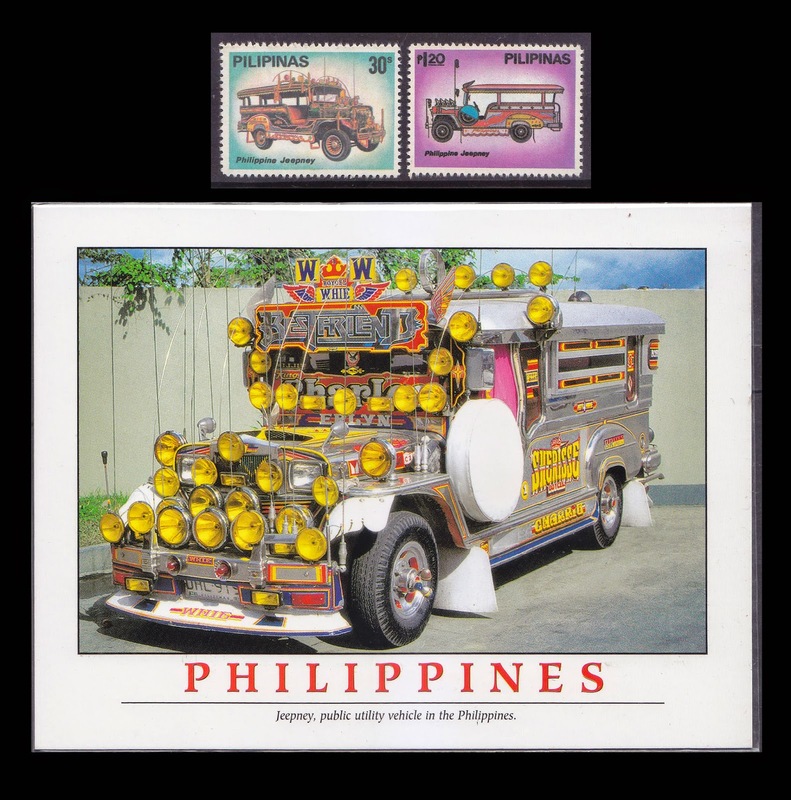 I remember I have many 1980 Jeepney sets in my stock, all as new as the postcard. I use Mike Wolfe's technique of bundling up two items up to get a better deal, and I hope I get a good result for this. If my idea works, I'll buy a bundle of this postcard and pair it with my stamps. I'm dreaming of earning my way up to the Sandman box. After I paid the cashier at the counter, she looked at the postcard and then looked at me. She asked, "Ibabalot pa natin ito, sir?" I said, "No. No need, I'll just tuck it in the book." The Beatles book automatically deserved a paper bag, after all, it's P718. 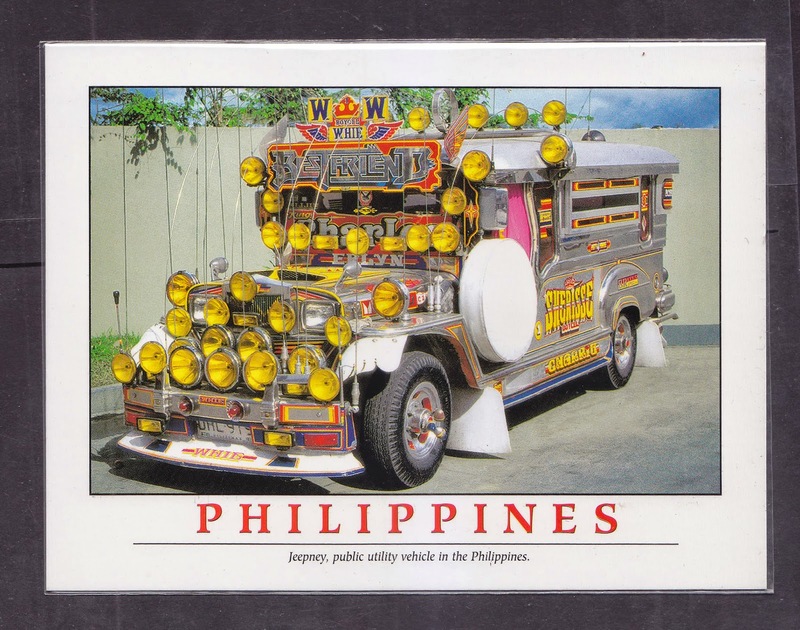 But a poor Jeepney postcard, P25, it must hitch a ride. That young woman's courtesy have been fully booked that she forgot that it's how you treat the small guys that gives you cache where it really matters: In your self-worth. I no longer know how it feels like to be a P25 person; I know I have leveled up, to P7,999 maybe?